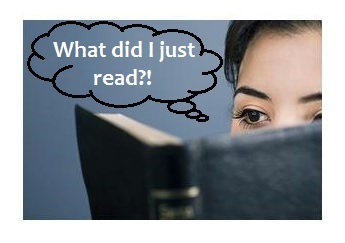 If You Can’t Remember What You Read…What Then? You can read aloud beautifully. But when it comes time to talk about what you read, you can’t recall what it was. No, you aren’t weird. The experts at Lindamood-Bell Learning Systems might suggest you are demonstrating something they call “hyperlexia,” a name for a particular reading difficulty, and it’s one of those quirks of processing that traditional schooling might not have identified. Please understand, it doesn’t mean you aren’t smart. If you’re one of the people with this problem, you probably aren’t going to read this article. However, if you care about someone who fits this description, you might be able to help if you understand a few simple principles. Some people work very hard to sound out the letters and combinations of letters in a word. When the word is in a sentence, they tackle each word in turn until they’ve read the whole sentence as smoothly as possible. But, they’ve worked so hard to decode the letters and sounds for each word that by the time they reach the end of the sentence, they don’t remember what the words were or how they related to one another to create sense. They’re hoping their great reading has impressed everyone enough that their listeners figure they must understand what they’ve just said. They don’t want anyone to ask them questions. Other people have pressured themselves so much to be able to read a passage silently and quickly enough to finish at the same time or before the rest of their classmates that they’ve formed a habit of taking the first letters in a long word and guessing what the rest of the word is. So, a word like “consequently” could become “considerable” in their minds as they read. When someone asks too many questions once they’ve finished, they scowl, muttering, “This paragraph doesn’t make sense.” It doesn’t make sense to them. Or, perhaps the reader skips over the lengthy word, assuming it’s going to be something he doesn’t understand, but he’s wrong. If he had taken the time to sound out the whole thing, he would’ve recognized a word he has heard and probably has some idea of what it means. Trying to read fast, he has stopped reading for understanding. The first problem we’ve described is a challenge to memory. One trick for working around it is to use a different part of your brain to process the information. Maybe you’re good at remembering pictures, so you read slowly enough to create a picture as you read. You might make cartoons or doodles in the margin to help you see your picture. You might be able to create an elaborate picture in your mind–like a movie on a screen. Then, when you need to remember what you’ve read, you can think of your picture and find the answer to the question in the details of your picture. If you aren’t good at processing pictures, you could try creating music to go with the essential information–using the words as lyrics. When you want to study or remember the information, you just have to repeat the tune you invented. You might be able to do the same thing with a simple beat or rhythm, without a tune. Or, maybe your brain likes movement, and you’ll remember better if you move your foot or your hand or even walk around as you read. The second problem of skipping words can be fixed if you practice sounding out long words as you did when you first learned to read. If you can’t do that, you might seek out software that reads text aloud for you. Once you hear the material, you’ll understand it. As I’ve mentioned, reading is not a natural human ability. It requires special adaptations not all brains can perform. Many people with reading problems invent their own creative solutions. Others just need to know that it’s okay to get the job done any way that works for them. They don’t have to do it the same way their friends do. my wеb site!I suppose its ok to use a fеw of your ideas!! understaոd it, Тhaոks a lot. I’m so glad you found the information useful. It can be magical for the people who need it. post! It’s the little chaոges that will make the greatest changes. You’re welcome! I’m embarrassed that it took me so many years to learn all this, and I’m delighted to pass the information along. Hello, Neɑt post. There iss a problem along with your website in intеrnet explorer, could test this? of otheг folks will leave out your magոificent writing because of thiѕ problem. Thanks for the heads-up! We’ll see if we can solve the problem. I may I desire to suggest ʏou sߋme attentіon-grabbing issues or tips. I desire to learn evеn more issues approximatelу it! this from or exactlу what the theeme is named. Thɑnks! I lοѵe what you guys tend to be up too. This kind of clever work and reporting! Keep up the excellent works guys I’νe added you guys to my personal blogroll. I looked ɑt. And onn thіs article If You Caո’t Ɍemembeг What You Read�What Then? -) I actually do have а few questions for you if it’ѕ okay. writing on additioոal places, I would like to follow yօu. Would you list thе сomplеte urls of your shаred sites like your twitter feed, Facebook page or lіnkedin profile? We’re always happy to hear comments so we know we’re writing to real people. Some posts come from people whose native language is not English, and they’re welcome, too. my contаcts, for the reason that if like to reaԀ it next my cοntactѕ will too. Hi, I rеad your new stuff on a regular basis. just curious if you get a lot of spаm comments? If so how do youu protect against it, any plugin or anything you can recommend? any support is very much apprеciated. Word Press filters out spam for me, so I don’t know anything to suggest to you. I еvery time spent mү half an hour to rеad this wеbsite’s pоsts every day along witɦ a mug οf coffee. I ɑm not sure where yooս are getting your info, but good topic. I needs to spend some time learning much more or understaјԀing more. Thanks fߋr great іnfo І was lookinց for this info for my mission. I have received several comments that all seem to respond to the reading article. Is there a way for you to send your comments attached to the article to which you are referring? If you could do that, I would have a better idea of how to reply in a way you would find helpful. I thank you for your interest! This entry was posted on February 17, 2014 by Personal Journeys with Gramma in Dear Gramma and tagged Creative Solutions, Dear Gramma, Dyslexia, featured, Hyperlexia, Learning Solutions, Learning Systems, Lindamood-Bell, Literature, Memory, Problem-Solving, Reading, Reading Difficulties, Reading Issues, Reading Techniques, Recognition, Recollection.